Sunday, July 26—OUR MAJOR FUNDRAISING EVENT! Cost: $25. children under 12 free. You can pre-pay below or pay at the tour at any of the homes. Cash, Check or credit cards accepted. 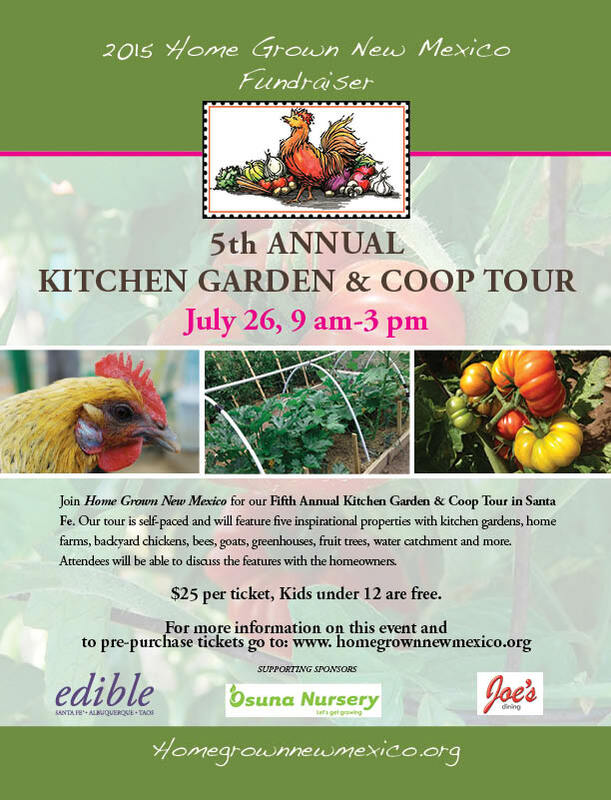 See five kitchen gardens in Santa Fe. Pick up ideas that you can use at your place or just enjoy these beautiful, edible and functional landscapes. The properties on the tour this year will feature many gardening ideas—beautiful vegetable gardens, herb gardens, fruit and nut trees, backyard chicken coops, goats, beehives, composting, green houses, a neighborhood community garden, edible landscapes and rainwater harvesting systems. Master Gardeners will be at each location to answer gardening questions and support the event. Pre-purchase tickets here on the eventbrite button or buy them at the tour at whatever house you first go to. Lisa Sarenduc-owner of Suitable Digs. This property has unique green vacation lodgings on her sustainable property where she lives. Her property features a greenhouse, fruit and nut trees, raised vegetable and berry garden, greywater system, a dome greenhouse with fig trees, another greenhouse with olive trees, a large rainwater catchment system, 1.5 acres of native grasses and flowers lining her driveway using key line design, a swimming pond and is completely powered by solar energy. Amelia Moody has been gardening at her home in Santa Fe for 10 years. Her lovely garden is continually evolving, as she acquires “gift plants” from her friends. 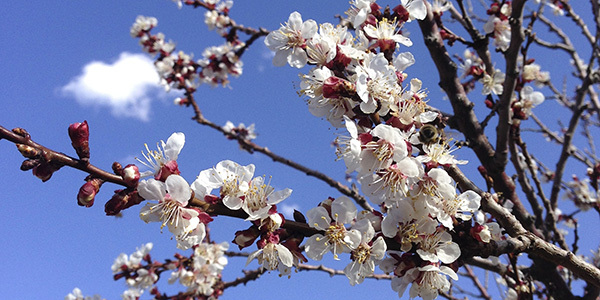 She has mature fruit trees and bed with mixed plantings of vegetables, flowers, medicinal plants and cacti, keeping a constant supply of flowers pollinated by her own honeybees. A giant Saguaro Cactus skeleton dominates her back yard. She also catches water from her roof, storing it underground in a 1000gal tank. Chickens will supply her with eggs through the year. A well tended compost pile rounds out her very balanced landscape. Deb Farson lives in a townhome with her cat Charley in town. She has been a master gardener for 5 years (in fact, she is the president of the Santa Fe Master Gardeners Association). She has been a Master Composter since 2002. Her property has a small footprint, but she has been able to pack in a lot of sustainability. Her perennials are xeric and include many native plants and shrubs in beds, pots and planters. She connects with the National Weather Service daily – measuring precipitation in Santa Fe. She catches rain from her roof to water her landscape – including raised vegetable beds. She fosters community – cooperating with neighbors in a truly neighborhood community garden. She crafts some of the best compost in town with the help of her neighbors, who contribute their food scraps all year round and get tomatoes in the summer in return. Bert Tallant and his wife Mari have been gardening in Santa Fe for over 25 years. Their garden showcases many of the sustainable features that can be accomplished in an urban setting. They converted almost half of their property into a vegetable garden. In the compact garden, they grow a substantial portion of their food for the year, including tomatoes, chile, corn, squash and raspberries – lots of raspberries. Bert has experimented w/ espaliered apple trees along the walls that enclose the garden. They use water captured from their roof and piped to the garden underground. A newly captured swarm of honeybees buzz about pollinating and making honey. Eggs are gathered daily from their chickens. They make their own high quality compost gathering materials from neighbors and the city. Jannine can be found selling her heirloom tomatoes at the Santa Fe’s Farmer’s Market in the summer and features her artisan farm on the tour this year. She strives toward sustainability. Her 6.5 acre property includes 3000 sq ft of raised vegetable gardens that supply her with food year round, garden art and flowers that feed her soul, over 30 varieties of heirloom tomatoes, fruit trees, strawberries, grapes and raspberries, 2 busy beehives, many drought tolerant, bee friendly gardens, chickens that give her eggs daily, Koko the horse and her buddies-the goats, a terraced herb garden, an unheated greenhouse full of tomatoes now and greens in the winter, a cold frame for fall/spring gardening, composting systems and even a resting hut fondly called the Tea House. Be prepared to wander and get lost on this lovely property that will surely inspire gardeners.